A couple of years ago I contemplated arranging a home exchange with a couple in Berlin. In the process, I had a telephone conversation with one Uwe Mueller during which we talked about our respective home towns and the previous home exchanges we had experienced. However, the word’s length is not as remarkable as its meaning: klammeraffe translates as “spider monkey” and if you find it peculiar that Germans compare the “at” sign with an animal, be aware that the rather pedestrian use of “at” in the English-speaking world represents the exception, not the rule. Israelis and Austrians respectively call it shtrudel, and strudel (pastry). Before computer networks were interconnected, an email could only be used to send messages to various users of the same computer. But once computers began to talk to each other over networks things became more complex. A means that could be understood by electronic posties was required to indicate to whom the electronic mail should be sent and, just like the postal system, a way to indicate an address was needed. This problem was solved in 1971 by Ray Tomlinson a Boston researcher at ARPANET, the precursor to the Internet. (Tomlinson died last year at age 74.) He selected the atsymbol to represent a separator between an email name and an email location. So while the “at” or “commercial at” designation may not be as evocative as the many animalistic ones that are used in some languages, it is an eminently logical one. Incidentally, the at symbol was not included on the keyboard of the earliest typewriters but it made its debut in one 1889 model and the commercially successful models from the Underwood No. 5 starting in 1900. 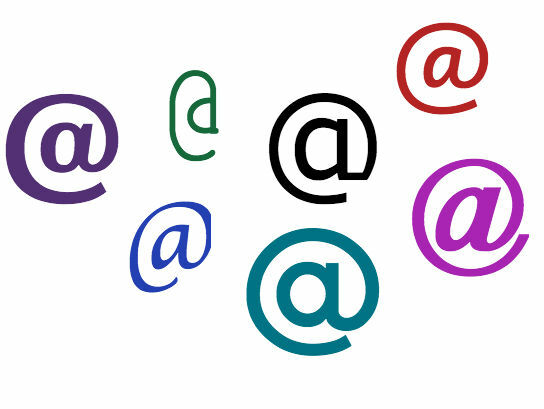 It is commonly believed that Tomlinson chose “at” as this quintessential email symbol precisely because it was not used that often although it sat on every keyboard. So even though the “at” designation is somewhat boring compared to the lurid metaphorical ones used in many countries, its name does have history on its side. In any case, “commercial at” is the official name for the symbol in the ASCII character set. While Tomlinson helped popularize the @ symbol, in reality it has enjoyed a long history. It was first used in the seventh century where it was a way of writing with one stroke the word ad which means “at” or “to” in Latin. Along its path, it has enjoyed other senses. For example, Venetian traders used it to signify “amphora,” a terracotta vessel that was a symbol of measurement. But it always kept its meaning of “at” and was often used as an accounting and commercial abbreviation meaning “at a rate of.” For example, the accounting record “10@£15” would designate ten units at the price of 15 pounds each unit. Most likely inspired by ampersand, the name for the & symbol – the designations ampersat and asperand have been suggested as names for the at symbol, but neither one has inspired much support. Tomlinson’s “commercial at” is still the preferred term. Be the first to comment on "Word Nerd: What’s an ‘at’ symbol? Hard to pronounce, mostly"